Does the THUM run as a Windows service on Windows 2000 and above? Yes, see THUM Service page for more information. Does the THUM require calibration? The manufacturer of the Temperature/RH sensor used in the THUM states that calibration is done at the factory and re-calibration is not needed. However if you need a traceable calibration certificate you can obtain one from an independent calibration lab like the one listed here. "Each sensor is individually calibrated in a precision humidity chamber with a chilled mirror hygrometer as reference. The calibration coefficients are programmed into the OTP(one time programmable) memory. These coefficients are used internally during measurements to calibrate the signals from the sensors. The sensor comes in a high-quality pin-type packaging (for 1.27mm sockets). Owing to full calibration and digital 2-wire output (CMOSens technology), the sensor is fully interchangeable. In this way, you are spared the elaborate and cost-intensive recalibration in case of a humidity sensor replacement!" Can I have more than one THUM per computer? You can NOT have more than 1 THUM plugged into a single computer. This is because of the way USB devices are addressed. You can have an unlimited number of THUMs on a network as long as each one is plugged into a different computer. What data formats can the Windows version of the THUM export to? The included data conversion program allows the THUM data to be exported to a csv(comma separated), dBase III, dBase IV, HTML, Excel, or another Access file. It also allows SQL queries during the export in order to export a portion of the data, such as a date range. Can the THUM call a cell phone or pager when an alarm occurs? It can NOT call a cell phone or pager directly. If there is demand for this feature we may add it to a future release. However, if your cell phone or pager can receive SMS messages via e-mail, then you can set the e-mail address in Options/E-mail Settings to be the address of your phone/pager. The Alpha (SMTP/Email) pagers provide you with the ability to send textual (and meaningful) messages to pagers and cell phones during the alert cycle using standard SMTP email functionality. Before configuring Alpha (EMAIL) pager alerts, you will need to get the following information from your paging service. Make sure that the email address that you use is in the correct format to be accepted by your paging service. Some have used address book entries that were actually converted by their email clients... obviously, THUM does not know about your address book entries and will not be able to convert "Bob's Pager" to a valid email address. A list of e-mail to SMS gateways can be found here. Make sure that your paging service will accept messages from either your SMTP relay host (mail server) or from the machine on which THUM is running. Also verify that the "FROM" address is valid as some systems may restrict delivery from a known set of addresses. While highly unlikely, some message servers may strip the subject line or require special headers within a message. In any case, make sure that you know what your paging service accepts and what they will deny. What is the maximum distance the THUM can be from the computer? Will the THUM run an external application when an alarm limit is reached? Yes, you can set a program to be run when an alarm limit is reached. The path and program can be entered in the Options/Alarm Settings tab. This can be handy if you need to perform a special task such as shutdown a server or send some other type of notification. Note: The THUM program will attempt to start your external program but, your program must control closing itself. If it doesn't exit on its own you could end up with multiple copies of your application running if multiple alarms occur. Note: THUM Service version requires some extra steps to allow the external program to run. The service needs to be allowed to have access to the desktop. Go to Control Panel/Admin tools/Services/THUMsvc and double click to get to the properties. Click the Log On tab. By default it will say Local System account. The box in front of "Allow service to interact with the desktop" needs to be checked. Here is an example batch file that can be used to shutdown the local computer using the psshutdown command. Psshutdown can be downloaded from the internet. Please remember that the alarm condition needs to be resolved before turning the computer back on. If the alarm condition has not be resolved the THUM service will run the error condition application or script as soon as the computer restarts. Also remember the Local System account user does Not have access to the network or network shares. If you need to save data to a network share, you will need to enter a username and password that is a local administrator on the computer with the THUM and also has write access to the network share you are trying to write to. Windows does not allow the software to be configured to both run an external program and save data to a network share. Can I change the layout of the html page generated by the THUM? You can change this file to contain any html or other text you desire. Any place that you want the THUM to enter its dynamic information into the temprh.htm file, enter one of the command words listed below. You can use the included template.htm as a guide. Note: The commands must have the start and stop # symbols and be in upper case. #ALARMCHECK# -- Add this command to the top of the file. If this command is present the THUM will change the font color of #TEMP# or #RH# if they exceed the current alarm limits. Can I change the layout of the e-mails sent by the THUM? You can change these files to contain any text you desire. Any time you want the THUM to enter its dynamic information when the e-mail is generated, enter one of the command words listed below. You can use the included alarmemail.txt and okemail.txt as guides. #FAILTYPE# -- States whether the last reading failed for temperature or RH. If both temperature and RH fail, it will state a temperature failure. What does the green light on the THUM mean? If the green light is on steady - it means the THUM is plugged in to a USB port and the Windows driver for the device has loaded properly. If the green light flashes, the THUM is sending temperature or humidity data to the computer. Why is MDAC 2.8 RTM and Jet 4 SP7 included in the THUM installation program? The THUM uses Microsoft MDAC/ADO/JET components to save data to an Access table. The Data Conversion Utility also uses ADO/Jet. We have found that many software installs attempt to install different versions of MDAC. This can lead to mismatched dll files, which may cause the THUM not to function properly. In an attempt to make the THUM installation as easy as possible, we have included the newest versions of MDAC and Jet in the install. This should update any mismatched files and allow all MDAC/Jet dependent applications to run correctly. If for some reason, you do not want to update the MDAC/Jet versions on your computer, e-mail support@practicaldesign.com and we can send you an install without MDAC and Jet updates. Can I create a shortcut to start the THUM program minimized? Yes, in the Target box of the shortcut add -min to the end. Can I write my own program to get data from the THUM directly? Yes. The THUM OCX, THUM DLL, Mac Library, or Linux library will allow you to write your own program to read temperature, RH, and dew point from a THUM. You could also create a program to read the temprh file and parse the readings. What are the temprh and config files in the HTML folder? MonitorName|Date-Time of last reading|Last Temp reading|Last RH reading|Last Dew Point reading|Alarm status. Why does the Windows THUM program give an error in SaveData? Most errors that mention Savedata are caused by using a Regional Language setting other than English (US) when running THUM software version 1.0.14 or older. To resolve the problem, either change the Region Language setting to English (US). Install the service version of the THUM software. If using version 1.0.x software, download and install version 1.0.17 of the THUM.exe file into C:\Program Files\Thum folder. Does the THUM software include a web server? No, currently the software does not include a web server. However, there are several web servers available. A sample list is provided below. Most on this list are free. Then check the event log and see if the descriptions are listed correctly. It appears to be a problem with the install program not always registering the THUM service with certain Microsoft Updates. We are working on modifying the installer to get the service installed correctly. Save data to a network share in the service version of the software. If you are running version 2.0.0 then it is the version that runs as a service. You can not just copy the install directory to a network folder, the program files must be on the local hard drive. However you can change the database directory and html directory in the THUM options to use a UNC name to a network folder. By default the local system account runs the THUM service which does not have network access. You will need to start the THUM service with a user that is a local administrator and has access to the network share were the database will be located at. Two devices should be able to write to the same shared database. You will want each device to have an unique 'Monitor number' and 'Monitor name' in the THUM Options so that you can query each device's data in the database. Go to Control Panel/Admin tools/Services/THUMsvc and double click to get to the properties. Click the Log On tab. By default it will say Local System account. The Local System account user can Not write to any network share. You will need to enter a username and password that is a local administrator on the computer with the THUM and also has write access to the network share you are trying to write to. Then go to the THUM Options page and change the database location to a UNC of your network share. Linux version stops responding or gives weird readings. Running the thumctl with out any switches or the -h switch is probably locking up the unit. The humidity switch has been the cause of problems on the systems. On distros that don't exhibited the problem, the THUM is very stable. Most kernels 2.6.12 and above work ok. Unable to Email or change Option settings in Vista or Windows 7. Another possible problem with email sending could be a firewall is blocking the program from sending email. For the THUM, both thum.exe and thumsvc.exe may need to have a firewall exception created so they can send email. It is possible to connect the THUM to a VMWare ESXi host and use USB Passthrough to connect the THUM to a single VM guest. The instruction below are for ESXi 5.0, but it should be possible on never versions of ESXi as well. On the VM that you want the USB device attached to, right click and select Edit Settings, click on Add... then select USB Controller, then Next, Next, Finish, OK. Let the USB controller install on the VM. Then, right click and select Edit Settings, click Add... again, and you should have a new entry for USB Device, select that and click next, on the next page you'll see a list of USB devices available to attach to the VM, select MCT Elektronikladen USB Temp/Humidity Sensor, then Next, Finish, OK. The THUM device should install on the VM. Please verify that a local firewall or antivirus program isn't blocking communication between the THUM.exe and Thumsvc.exe programs. Check that the THUM is plugged into a USB 2.0 port. Some customers have reported the THUM does not always work properly on USB 3.0 ports. Updating the USB 3.0 hub drivers can resolve the issue or disabling USB 3.0 support in the BIOS. Try connecting a USB hub into the computer and then plugging the THUM into the hub. This is generally related to USB 3.0 ports and may be due to how the onboard Generic Hub is downconverting from USB 3.0. Confirm .Net 3.5 is installed. .Net 3.5 can be downloaded from the Microsoft site. 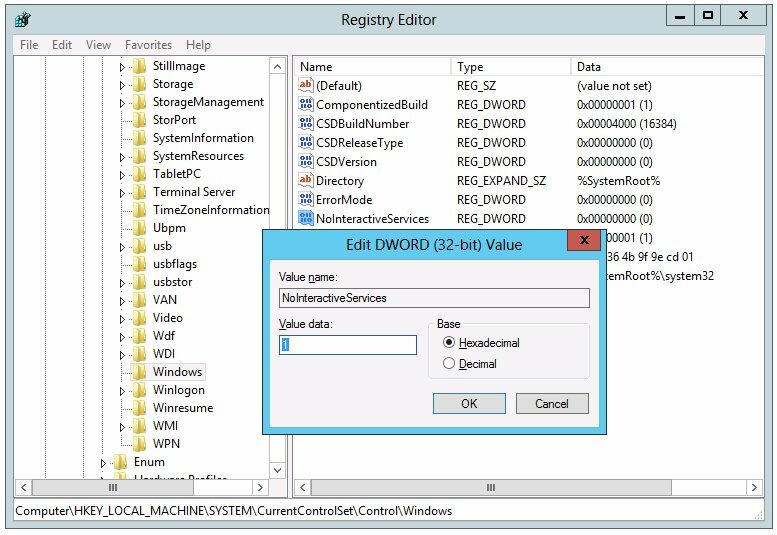 On Windows 2012 server and Windows 8.x systems try enabling NoInteractiveServices in the registry. Microsoft has changed the default for this option on newer versions of Windows. I wanted to drop you a line about the THUM device we just purchased... Excellent product, kudos to you folks! Received my THUM yesterday and love it. Its extremely easy to setup and use.